Toyota of Victoria is thrilled to present the new 2018 Toyota Camry to the people of Houston. The Camry has proven popular over the years because it is a functional and reliable midsize sedan. The 2018 Camry certainly fits this description, but the car’s styling and driving platform have been upgraded for this model year. These changes mean that the new Camry truly is the best both worlds and it does not compromise anything. The Camry has benefited from a major redesign to its styling for 2018. Take a look at its beautiful, sleek, and dramatic front grille. This gorgeous look extends throughout the body of the car. There are up to 13 different paint colors and color schemes available on the Camry depending on which model you choose. However the changes to the 2018 Camry are more than cosmetic. The platform of these vehicles has been enhanced to create a more consistent and fluid feeling while driving. Increased handling and decreased cabin noise are just some of the new benefits of the 2018 Camry. There are ten distinct Camry options to choose from. Let’s dive right into the highlights of this diverse lineup. First on the list is the Camry L. The L has Entune 3.0 audio and navigation with included app suite. This is an impressive premium feature that is unmatched in this category. 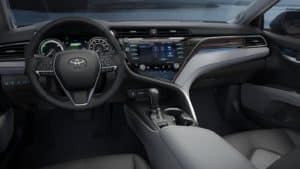 The Camrys LE, SE, and XLE can be upgraded to include such features as: an 8-way power adjustable driver’s seat, an attention-grabbing grille modification, or even dual zone automatic climate control. Each of these Camrys is also available in Hybrid form as the Hybrid LE, Hybrid SE & Hybrid XLE. These hybrid models are competitively priced with attractive features, including a standard 2.5L Dynamic Force 4-cylinder DOHC dual-injection Hybrid engine. This engine gets an eye-popping EPA-estimated 51 MPG city and 53 MPG highway. Rounding out the lineup next is the XLE V6 model which, as the name implies, has a powerful V6 engine as well as a breathtaking panoramic moonroof. Finally, the XSE and XSE V6 have stunning catamaran-inspired styling, a sport grille, and an available contrasting black metallic roof. Toyota has taken a firm stance on safety in the auto industry, and has demonstrated that the safety of its customers is its top priority. That’s why Toyota Safety Sense P (TSS-P) is included standard in every 2018 Toyota Camry. 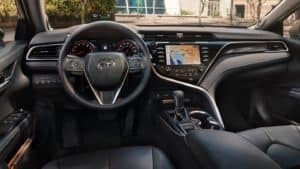 This comprehensive group of features includes a pre-collision system with pedestrian detection, lane departure alert with steering assist, automatic high beams, and a dynamic rear cruise control that automatically monitors and adjusts to forward traffic. See a Toyota of Victoria representative today for more information on Toyota Camry’s impressive safety features. Toyota of Victoria would be proud to earn your business if you are interested in a new or used vehicle. We know you have lots of dealership options near the Houston metro-area, so we hope to earn your business through our integrity and commitment to client satisfaction. Whether you live in San Antonio, Port Lavaca, Corpus Christi, or beyond Toyota of Victoria is waiting to take you on an informative test-drive of the 2018 Camry.